I know it’s been a month since NYE but I wanted to share a fun party trick I used for our little get together. Don’t worry- you don’t have to wait until next NYE, you can use it for any party! I bought a roll of Kraft paper a while back and I’ve been having fun using it for entertaining. So far I’ve used it for book club, casual post-thanksgiving gathering and game night. I love this idea for so many reasons… First you can buy rolls of Kraft paper at many grocery stores and even Walmart on the cheap. Second, it’s disposable. 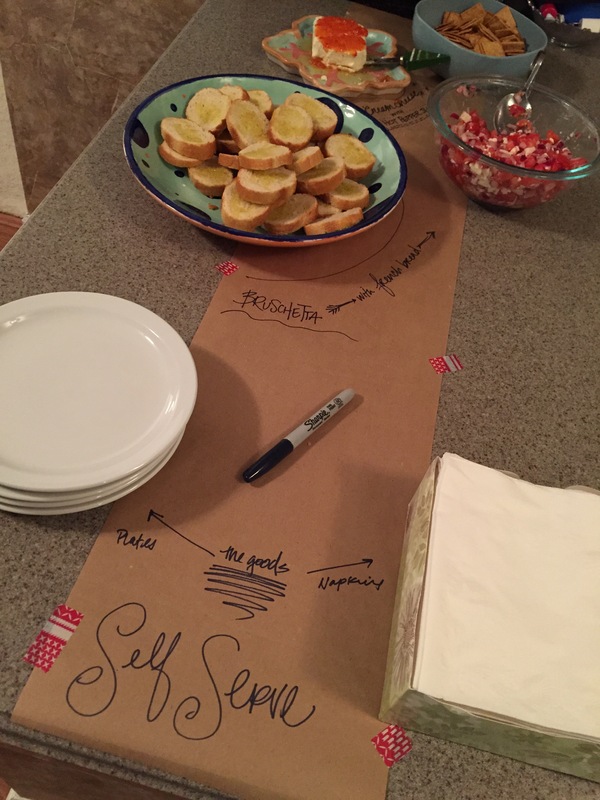 Third, it’s a festive way to add some unique decor and a functional and fun way to label dishes. There is so much you can do with it! I simply rolled out my paper (cut to a 12″ runner size in this case) where I was going to have our “bar” area. 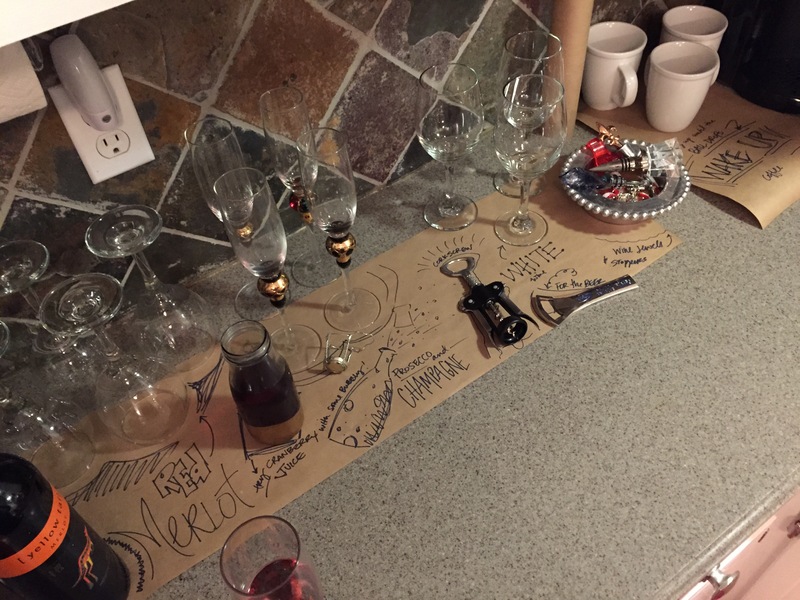 I used a sharpie to outline the glasses, label wines, and even outlined the corkscrew. I tried to vary the size of the letters and different vibes for each word. I had fun and made a whimsical illustration of Champagne and used the marker to label cranberry juice that I had put in a small carafe. As most of our guests are tired young parents like ourselves, I knew midnight was passed most of our bedtimes. 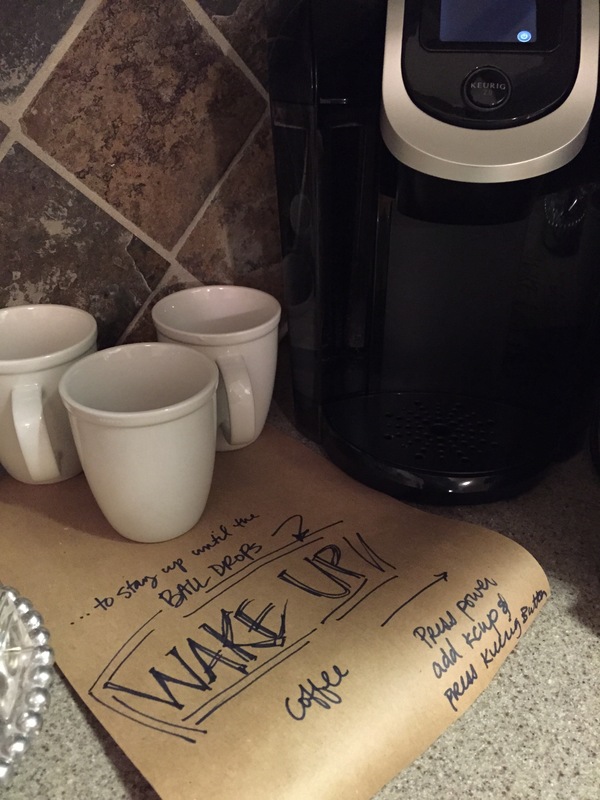 I made sure the Keurig was ready (thanks, Santa!) and set out some coffee mugs with a K-cup in each one. Then I wrote simple direction for the Keurig. *** Side note: I just got a reusable K-cup so I can have any local coffee I want and be more “green” …BTW- have you seen this video?!?! Worth a quick watch. I also used the paper on our kitchen’s peninsula for some of the food. I left the marker and open spaces for party guests who were bringing dishes to share. I added washi tape to keep everything in place and to keep the end from rolling up. Whenever I use this I get tons of comments on how clever it is. It is literally a blank slate for your party. Cut the edges with scrap-booking scissors, use washi tape, different markers, use movie quotes or fun facts that pertain to your theme. Anything is possible! I doesn’t need to be perfect. Have fun with it! I had the pleasure of hosting a casual family get together over Thanksgiving. Nothing too fancy- chili, macaroni and cheese and some spirits. No need for place settings but I wanted to have the house feel like the holidays without having to decorate for Christmas just yet. 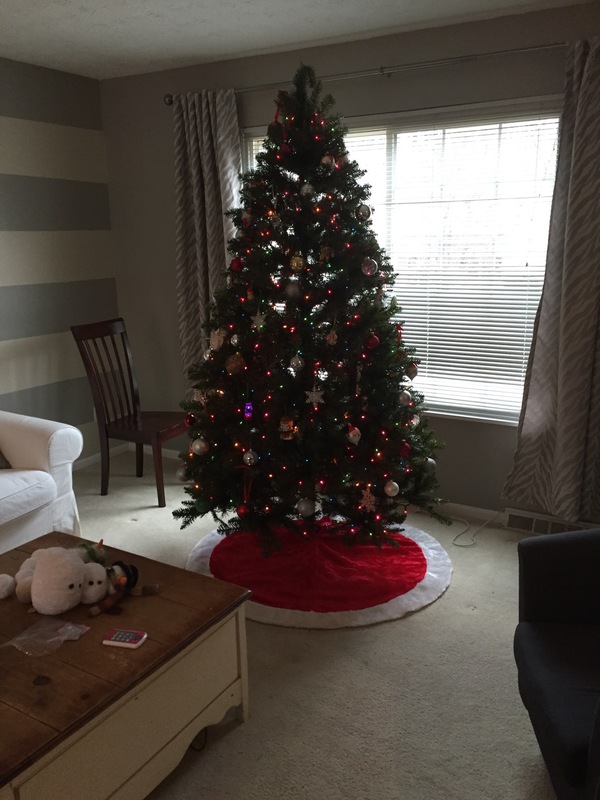 I’m like Nordstrom: you will not see Christmas here until Thanksgiving. 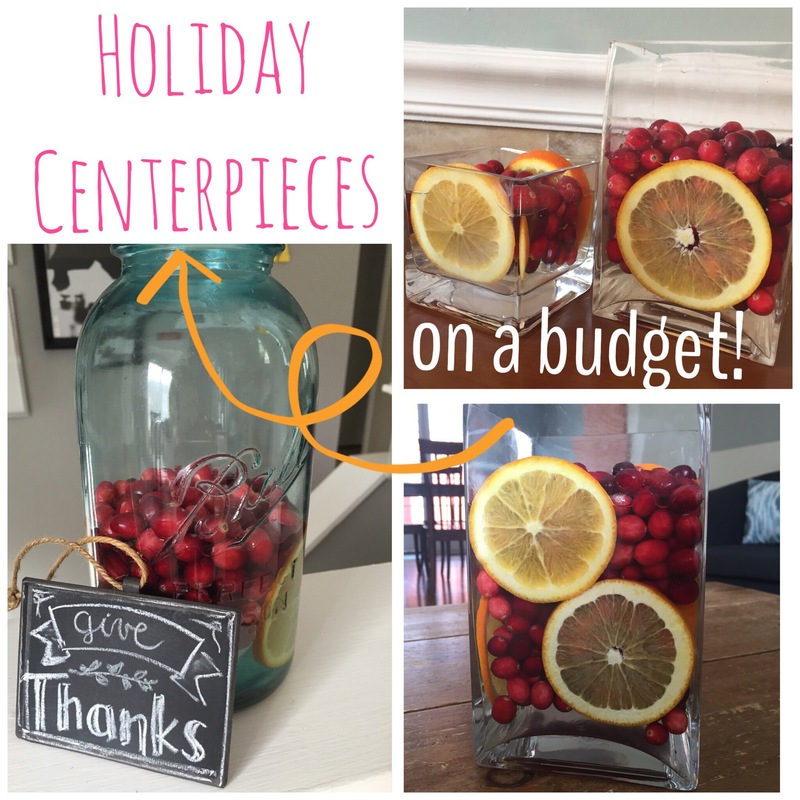 Obviously due to the holiday I had time restrictions and I’m always looking to be budget friendly. So I scoured the grocery store earlier in the week for a little inspiration. 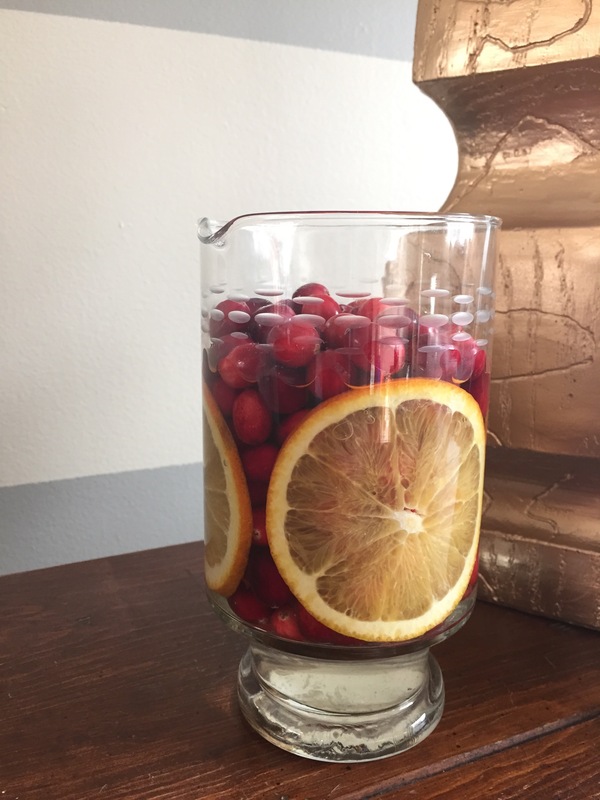 I started by finding some of my favorite vases with broad or straight sides. And of course my favorite mason jar. 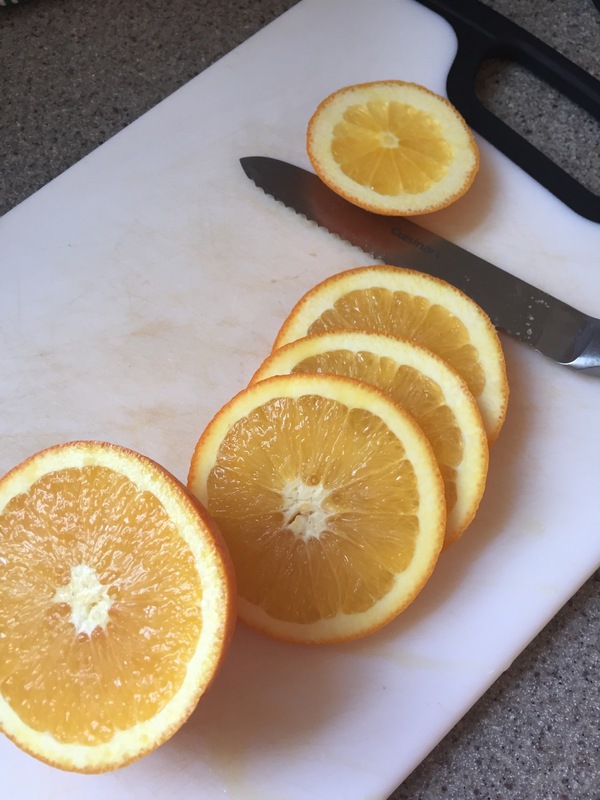 Then I thinly sliced the oranges (a mandolin is helpful here if you aren’t a great slicer) and discarded the smaller slices and the ones without the star burst pattern. I set them aside to make a little pot of stove top scent (Psst: Toss orange slices, 5 whole cloves, a splash of vanilla and a couple of cinnamon sticks in with 2 cups of water and simmer for a holiday scent that fills the house and lasts all day!). 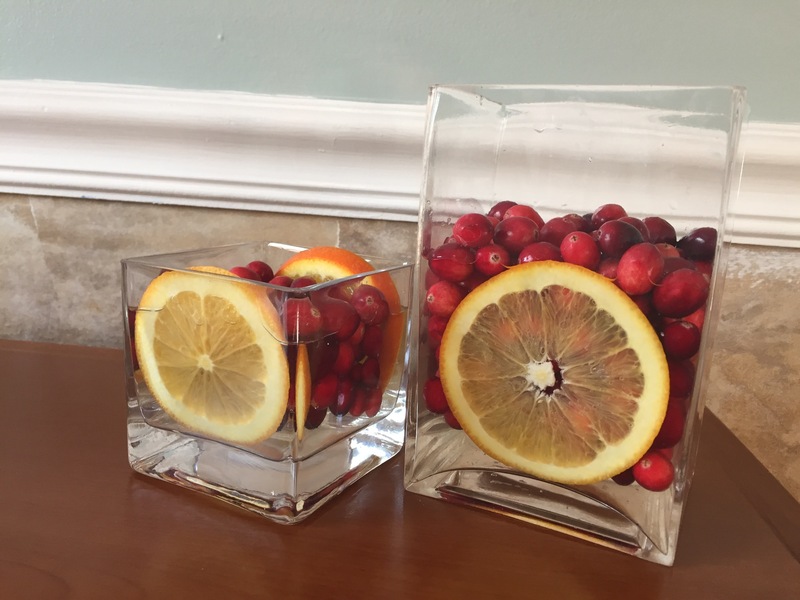 I lined the sides of my vases with the orange slices and filled them with cranberries. 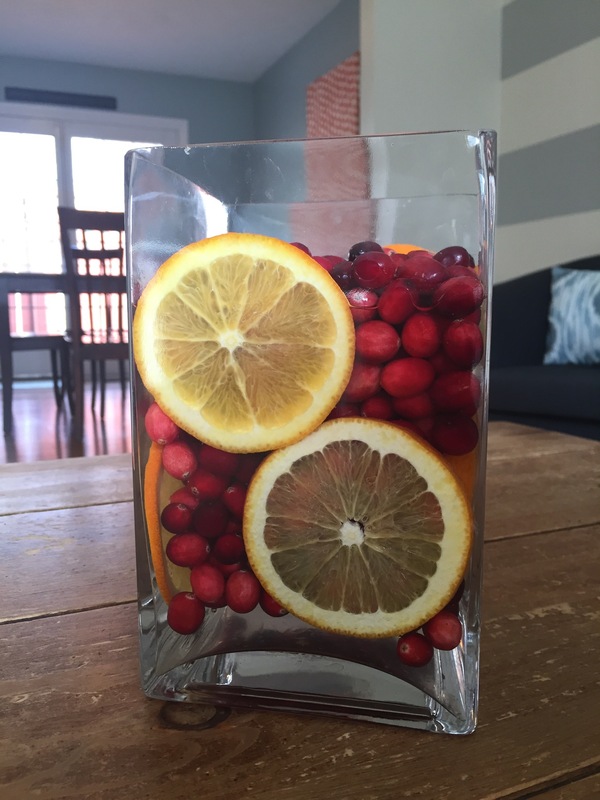 Then I filled each vase with water until the cranberries were just slightly afloat. I placed each vase around the house and had intended to run to get fresh white flowers (hydrangeas? roses?) to completely the centerpiece vibe. But I really liked how simple and cheery they were without flowers so I saved myself the trip and left them as they were. 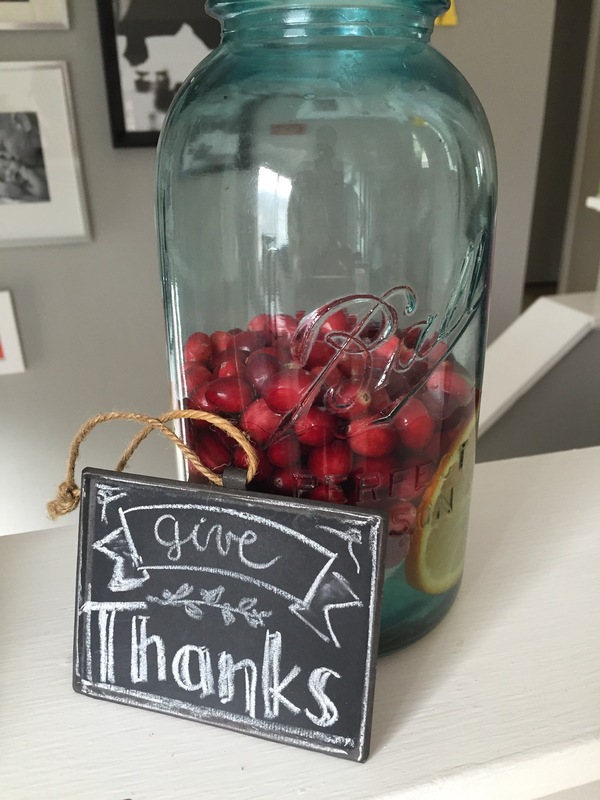 I grabbed a little beverage chalkboard I had and made a quick “Give Thanks” sign. These were complimented all night! I especially like that they are appropriate for Thanksgiving as well as Christmas and New Years. Oh, and the fact that I made 5 centerpieces for less than $8 is pretty awesome too. Easy, inexpensive and quite darling if I may say. We made a batch of my famous “Real Blueberry Muffins” from scratch. O has become quite enthusiastic about baking and insists on helping in almost every kitchen activity. Aprons are her new favorite “dress up”. I got a Wilton Gingerbread house on sale at Michael’s the other day for $9. Total impulse purchase but O has been asking to make it every single day since we bought it. I finally caved… she was so excited (below is her actual “excited” face). 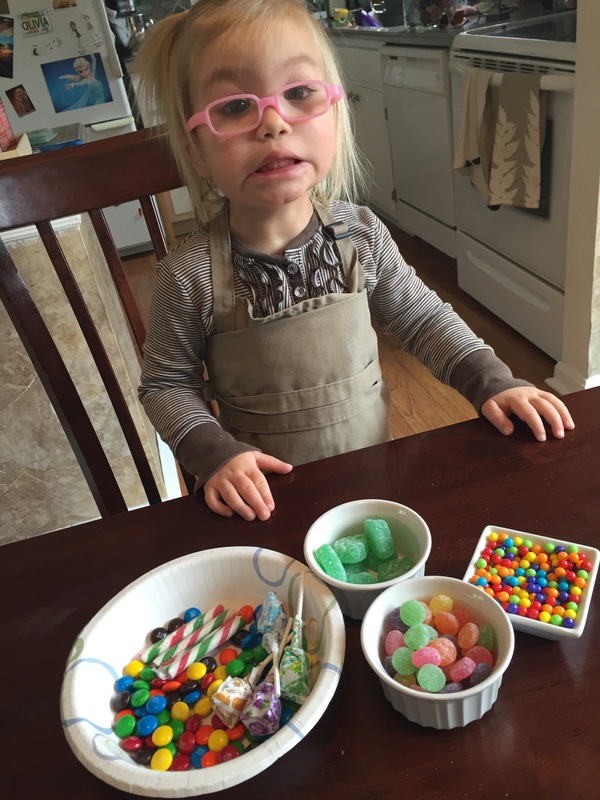 Mom note: this was a great excuse to use extra Halloween candy or undesirable candies left over. While I’m at it… I have to tell you a life changing secret that I only discovered a few years ago. Bold and italic there, friends. Truly a life saver. 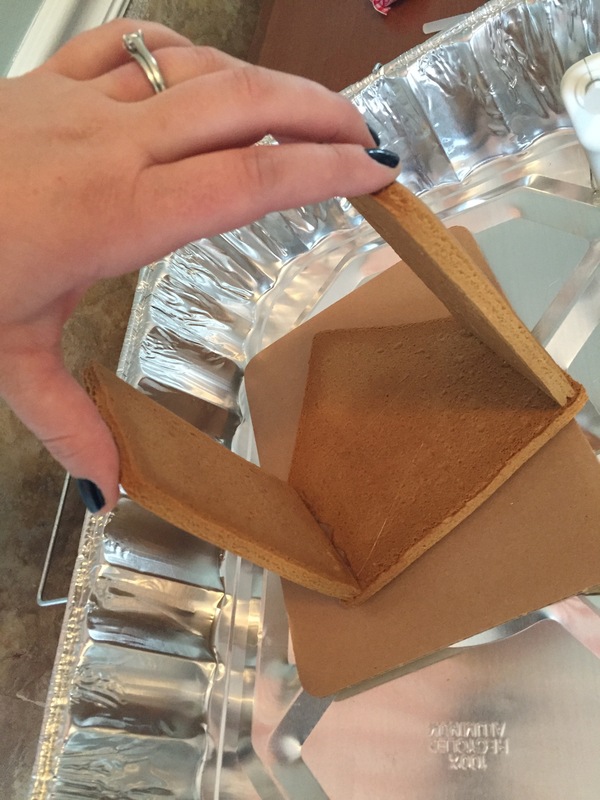 It saves tons of time and even more stress if you assemble the gingerbread house frame using hot glue rather than the icing provided in the kit. I use mine on high but I think any setting will do. I just put hot glue on the seams that I want to attach and hold in place for a few seconds. Repeat for all the sides and do the roof pieces last. Hot glue… what can’t it do? Then O and I developed a little rhythm. I’d make a “blob”, she’d choose a candy to place there. Almost all of the design choices here are hers. I did make the door, windows, wreath and bow. 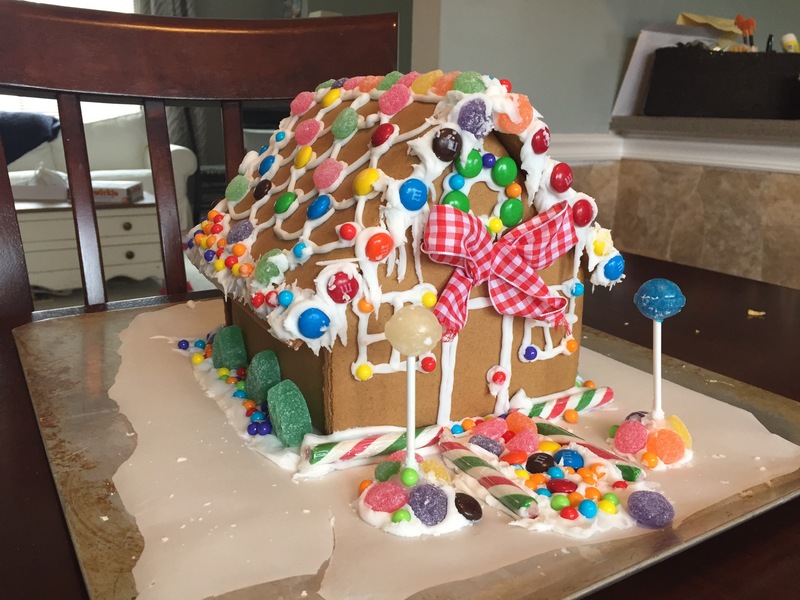 But she made the roof with me, sidewalk, sides of the house and all. I just kept piping icing and she kept sticking candy there. You know, between stuffing her face with m&m’s. I cheated and did the bow and Dum Dum trees with hot glue as well. A while back a friend asked me what kinds of things I do with kids on the cheap and with a baby in the house. It is always a challenge to keep older siblings busy while you are strapped to house by baby naps, and forced to be quiet. Cold winter days and rainy spring afternoons only make this harder. Another challenge for many of us is the cost of so many activities, outings and toys. I’ve compiled a list of simple thrills for kids up to 5 years old. Most don’t cost much money… and I really believe in making memories with kids. They won’t remember the stuff and much as they remember doing things together. Kind of like at Christmas… O loved all the wrapping paper and boxes and barely noticed most of the gifts. 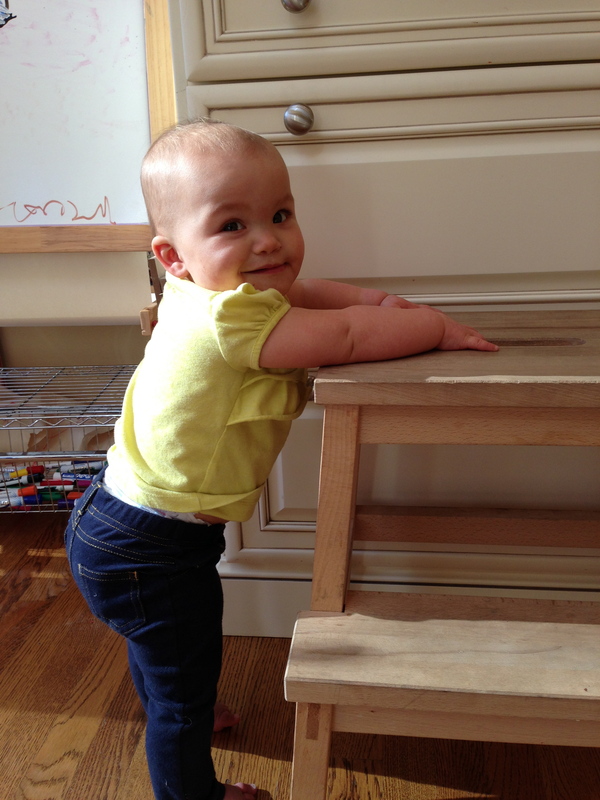 While diapers are expensive, kids only cost as much at you let them cost. I mean, look at this face. Stamps and Stickers: A&Z both loved stamping all over a pad of newsprint. I bought a bunch in the clearance bins at Michael’s and the dollar store. 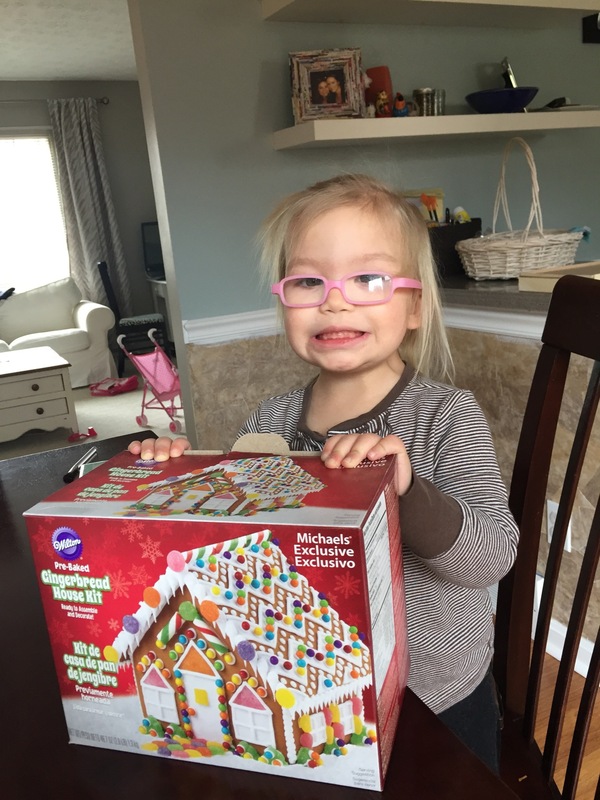 Melissa and Doug sell a few little sets too. Also, look for “foamies”… Little foam stickers. Paper isn’t the only place for stickers. I’ve let them decorate their art boxes, shoe boxes and all kids of things with stickers. Its amzing how much time kids can spend with this activity. For younger kids it can be an opportunity to idenify animals, shapes and expand vocabulary. For older kids it provides a creative outlet and can spark a little imagination. Crayons: Have you seen those Crayola crayon holders for little hands? Huge help to get him going on controlling a crayon. Larger and thicker crayons can be easier for little hands too. Talk about colors, shapes, even start some letter recognition. Recycled Crayons: Preschoolers love this one. We keep old crayon nubs and broken pieces of crayons around for a while. Eventually we dig them out of the crayon tub and separate them from the useable ones. Then I let the kids make piles of the nubby crayons in a muffin tin (mini muffin tins are best because it doesn’t take as much to fill them and the crayons you make become thicker). The piles don’t have to match or have any of the same colors… you really can’t do this wrong. Then I place the muffin tin in a 250 degree oven and check on them every 5 minutes or so. When the crayons have melted to liquid I slowly remove the tin from the oven… hot liquid wax is dangerous. Then we let them cool for an hour or so and pop out our new recycle crayons! The shape is easy for kids to hold and when they use them they are coloring with a rainbow or tie dye effect. For older kids I ask them to make observations about what might happen before we put them in the oven and the happened after and why they think it. Doesn’t hurt to add a little science to it! Go Big: Another big hit is a bunch of giant sheets of paper and a long roll of paper I bought from Ikea. Z still loves to have me draw roads and tracks for his cars and trains …and with a roll of paper they can go on forever! We have made signs with giant messages to welcome new cousins to the world and then we took pictures with the kids holding it and sent them in texts or posted them online for family. You can make birthday signs for each person’s birthday to hang in a doorway, or welcome them home from a trip. We also trace hands, toys, do leaf rubbings, and he thinks its way cool that we lay on the floor to draw. The possibilities are endless! Playdoh: I probably don’t need to tell you that it is amazing. We have tons of it and to be honest you only need a few colors and a couple of the utensils. 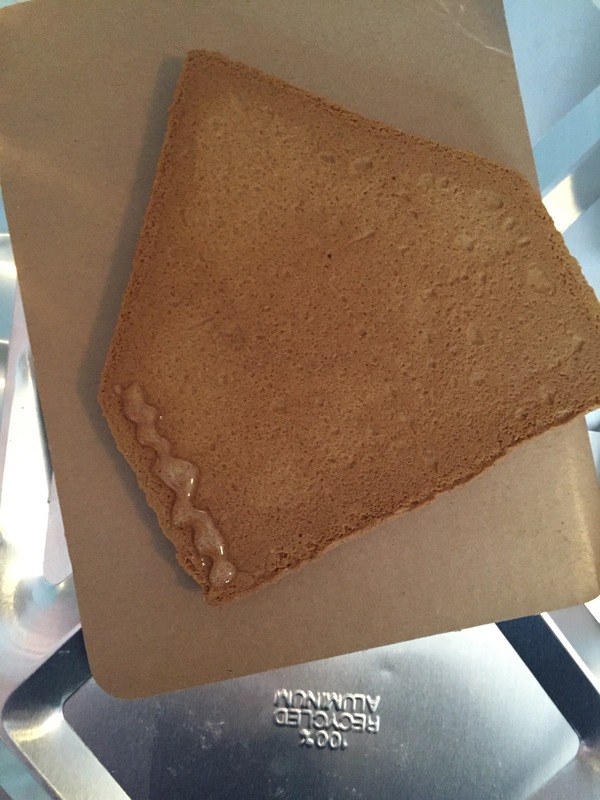 If you don’t want to buy any try this recipe I posted a while back for homemade dough. Big kids love measuring and making it. And everyone loves playing with it. As far as what to use for utensils: stamps work on playdoh, kitchen utensils like a butter knife or whisk, anything with texture, cups, cookie cutters, ice trays and the list goes on. Playing with dough is great for small motor skills, imagination and sensory development. I actually find it relaxing myself. Nature Walks: Give kids a bag to “collect” anything he thinks is cool on a walk. Bring them home and talk about all the things he found, the season, animals, rocks… Whatever. This always sparks conversation. “I Spy”, “Follow the Leader” and “Simon Says” are also a fun games for a nature walk. Don’t live near a trail? So what… a walk down the sidewalk or through a park is just as exciting. Even if it’s snowing a 15 minute walk and fresh air can cure cabin fever. I’ve also had older kids help me make a list of things we think we may find and then make it more of a scavenger hunt for them. Make Wishes: I keep pennies in my car for making wishes in fountains we pass by. Sometimes we make a point of finding a fountain to make a wish in. We count our pennies, observe the years on them, and close our eyes and wish reeeeally hard. Storytime: You can’t read to a kid enough. Go to the library and get new and unfamiliar books often. Make your own storytime… we cuddle up in a blanket and read all of our books as soon as we get home. And do it again a few times a week. This often suffices as “rest” for kids who no longer nap but still need some chill out time midday. Check your library’s and local bookstore’s schedules. Many of them have regular story time, music play and such for free! Puzzles: Those wooden ones with pegs are great. Most kids can do some large piece ones, and anything with the alphabet. Use the Go Big method above to make your own puzzles. If your kids get tired of puzzles or have them all memorized consider swapping puzzles with friends for a couple of weeks. Fresh puzzles for everyone! Play House: Have a “picnic” with pretend food, “cook” and stuff too. Let the kids lead the way. They love being in charge and telling us what to do for once. It’s always interesting to hear their perception of roles in the household too. I”ve heard kids say, “We need to go to Target. Can you be on your best behavior?” or “I’m going to drop the kids at school and go get coffee.” They can do this for hours! Build A Fort: This is a great exercise for problem solving, imagination and creativity. Building the fort is a blast and using it is fun too. Consider reading books, doing puzzles or “hiding out” in the fort. Kids think I’m a genius when we do this. Inside Picnics: We eat lunch somewhere besides the kitchen table. We have done it in a fort, at the coffee table, under the kitchen table, with his stuffed animals, on the front porch, in the tailgate of my SUV. Anywhere. PJ Day: Let the kids wear their PJ’s all day. Even go to the grocery store with them on. They think its so silly and funny. On this day we also do breakfast for lunch. Pancakes for lunch is always a hit! Make Noise: (Ok- not too much). Have concerts with paper towel and toilet paper tubes, tissue boxes. Filling baby food jars or pop bottles with beans, rice and pasta makes great “instruments”. None of them make too much noise though. Scavenger Hunt in a Bottle: Fill a clear soda bottle about halfway with rice. Drop in random objects to “find” in the rice. Think crayons, beads, paperclips, pennies, bouncy ball… anything that will fit in the hole and you won’t miss. The more rice in the bottle, the harder it is to find the objects. Seal the bottle (I always add super glue to avoid disasters) and start searching. Kids can roll the bottle every which way to find the objects. Penne Picasso: Glue pasta on paper. So simple- he can’t mess it up, there is no paint and its inexpensive! Use pasta to make necklaces on yarn to to decorate a shoe box. Ball Pit: Ikea, Target and other big box stores sell those plastic balls for ball pits. Put them in a pack n play or crib for an instant ball party. This never gets old. And when he’s done he can help you clean them up. For bigger kids let them fill as small room. 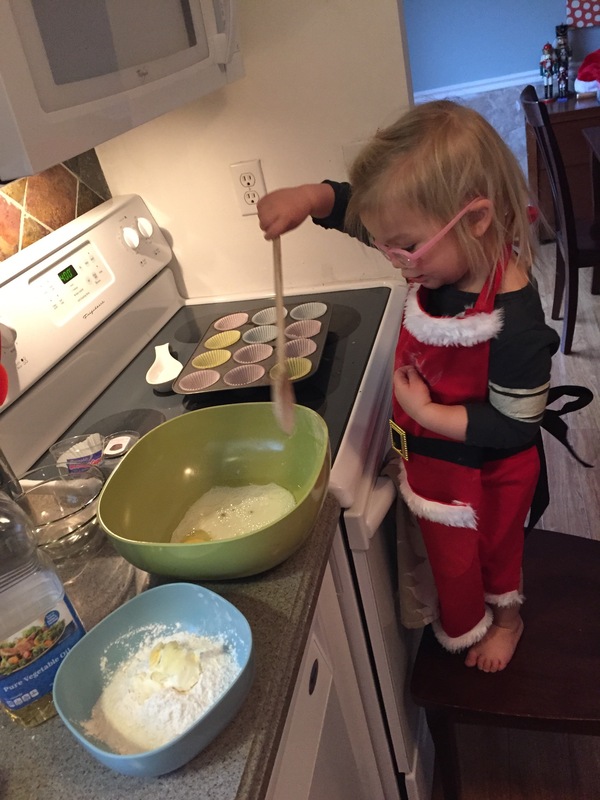 Cooking and Baking: Let kids help prepare their meals. From choosing a plate and utensils and setting the table to letting them stir and teaching them to measure. You’ll be surprised how happy they are to help. They really do like a little responsibility! And preparing food together makes time for a good little conversation. It’s often the only way I can get the “What did you do at school today?” question answered. You can also teach them about their food and where it comes from along with encouraging trying new foods and making them aware of a having healthy diet. Sink or Float: Gather some household items to see if they sink or float. Use a baby pool or bucket outside or use the bathroom tub. Have kids guess which will happen and why. A fun one is a Diet Coke can vs a Coke can. Apples are heavier and most kids think it will sink but they float. Try to stump each other!